It was not until after my friend’s departure that I suddenly recollected the mysterious interview which I had been told of as preceding the suicide of young Prescott. Then I thought of the ravings of poor Reeves, rendered more tragic by the fact that I had heard that very day of his death. What was the meaning of it all? Had this woman some baleful secret to disclose which must be known before her marriage? Was it some reason which forbade her to marry? Or was it some reason which forbade others to marry her? I felt so uneasy that I would have followed Cowles, even at the risk of offending him, and endeavoured to dissuade him from keeping his appointment, but a glance at the clock showed me that I was too late. I was determined to wait up for his return, so I piled some coals upon the fire and took down a novel from the shelf. My thoughts proved more interesting than the book, however, and I threw it on one side. An indefinable feeling of anxiety and depression weighed upon me. Twelve o’clock came, and then half-past, without any sign of my friend. It was nearly one when I heard a step in the street outside, and then a knocking at the door. I was surprised, as I knew that my friend always carried a key—however, I hurried down and undid the latch. As the door flew open I knew in a moment that my worst apprehensions had been fulfilled. 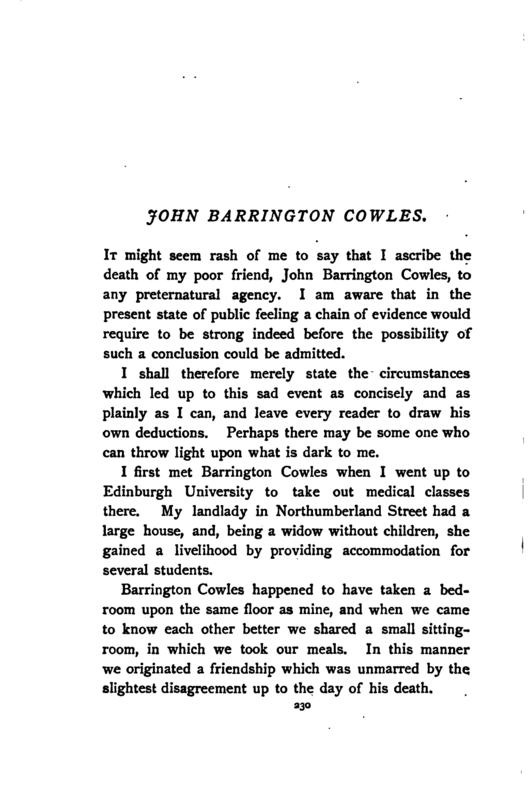 Barrington Cowles was leaning against the railings outside with his face sunk upon his breast, and his whole attitude expressive of the most intense despondency. As he passed in he gave a stagger, and would have fallen had I not thrown my left arm around him. Supporting him with this, and holding the lamp in my other hand, I led him slowly upstairs into our sitting-room. He sank down upon the sofa without a word. Now that I could get a good view of him, I was horrified to see the change which had come over him. His face was deadly pale, and his very lips were bloodless. His cheeks and forehead were clammy, his eyes glazed, and his whole expression altered. He looked like a man who had gone through some terrible ordeal, and was thoroughly unnerved. “Cheer up!” I answered, trying to encourage him. “A what?” I asked, for he had paused. “Did you ever read of wehr-wolves?” he asked. He pondered for some minutes, and then he cried out for some more brandy. There was a small bottle of laudanum upon the table, and I managed, by insisting upon helping him myself, to mix about half a drachm with the spirits. He drank it off, and sank his head once more upon the pillow. “Anything better than that,” he groaned. “Death is better than that. Crime and cruelty; cruelty and crime. Anything is better than that,” and so on, with the monotonous refrain, until at last the words became indistinct, his eyelids closed over his weary eyes, and he sank into a profound slumber. I carried him into his bedroom without arousing him; and making a couch for myself out of the chairs, I remained by his side all night. When he came to himself he was an altered man. His severe illness had emaciated him greatly, but his dark eyes had lost none of their brightness. They shone out with startling brilliancy from under his dark, overhanging brows. His manner was eccentric and variable—sometimes irritable, sometimes recklessly mirthful, but never natural. He would glance about him in a strange, suspicious manner, like one who feared something, and yet hardly knew what it was he dreaded. He never mentioned Miss Northcott’s name—never until that fatal evening of which I have now to speak. In an endeavour to break the current of his thoughts by frequent change of scene, I travelled with him through the highlands of Scotland, and afterwards down the east coast. In one of these peregrinations of ours we visited the Isle of May, an island near the mouth of the Firth of Forth, which, except in the tourist season, is singularly barren and desolate. Beyond the keeper of the lighthouse there are only one or two families of poor fisher-folk, who sustain a precarious existence by their nets, and by the capture of cormorants and solan geese. This grim spot seemed to have such a fascination for Cowles that we engaged a room in one of the fishermen’s huts, with the intention of passing a week or two there. I found it very dull, but the loneliness appeared to be a relief to my friend’s mind. He lost the look of apprehension which had become habitual to him, and became something like his old self. One night—I think it was our third or fourth on the island—Barrington Cowles and I went outside the cottage before retiring to rest, to enjoy a little fresh air, for our room was small, and the rough lamp caused an unpleasant odour. How well I remember every little circumstance in connection with that night! It promised to be tempestuous, for the clouds were piling up in the north-west, and the dark wrack was drifting across the face of the moon, throwing alternate belts of light and shade upon the rugged surface of the island and the restless sea beyond. “Who?” I cried, straining my eyes into the darkness. “Come into the house,” I said. His hand, as I grasped it, was as cold as ice. The fishermen and I walked round the island all that night with lanterns, and examined every nook and corner without seeing a trace of my poor lost friend. The direction in which he had been running terminated in a rugged line of jagged cliffs overhanging the sea. At one place here the edge was somewhat crumbled, and there appeared marks upon the turf which might have been left by human feet. We lay upon our faces at this spot, and peered with our lanterns over the edge, looking down on the boiling surge two hundred feet below. As we lay there, suddenly, above the beating of the waves and the howling of the wind, there rose a strange wild screech from the abyss below. The fishermen—a naturally superstitious race—averred that it was the sound of a woman’s laughter, and I could hardly persuade them to continue the search. For my own part I think it may have been the cry of some sea-fowl startled from its nest by the flash of the lantern. However that may be, I never wish to hear such a sound again. You ask me, no doubt, what my own theory is which will explain all these strange facts. I have none, or, at best, a dim and vague one. That Miss Northcott possessed extraordinary powers over the minds, and through the minds over the bodies, of others, I am convinced, as well as that her instincts were to use this power for base and cruel purposes. That some even more fiendish and terrible phase of character lay behind this—some horrible trait which it was necessary for her to reveal before marriage—is to be inferred from the experience of her three lovers, while the dreadful nature of the mystery thus revealed can only be surmised from the fact that the very mention of it drove from her those who had loved her so passionately. Their subsequent fate was, in my opinion, the result of her vindictive remembrance of their desertion of her, and that they were forewarned of it at the time was shown by the words of both Reeves and Cowles. Above this, I can say nothing. I lay the facts soberly before the public as they came under my notice. I have never seen Miss Northcott since, nor do I wish to do so. If by the words I have written I can save any one human being from the snare of those bright eyes and that beautiful face, then I can lay down my pen with the assurance that my poor friend has not died altogether in vain.